Writing, Writing, Writing... It is definitely an area that our school is concentrating on every year. Especially our 4th grade students that have to take a state writing assessment. Today, some of my 4th grade classes participated in Kate Messner's Google Hangout sponsored by We Are Teachers. She was specifically discussing the writing process of her Ranger In Time series. 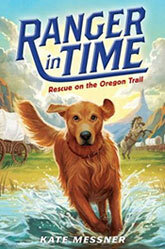 This series is about Ranger, a search and rescue dog, who travels back in time to help people. Kate was so open about showing different parts of her work. She held up her writer's notebook with her brief phrases about ideas. She showed a long piece of paper where she collects all her ideas about a story in one place before she starts. 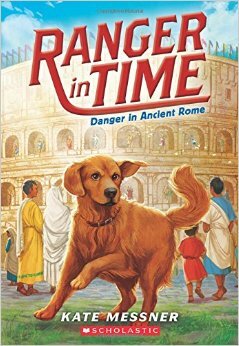 The students were shocked to hear that it took almost 2 years to write and publish a book! They were also glad to hear that even professional writer's have their papers marked up by editors. Our students were also surprised to hear one of the guest classes ask a question about what kind of "leads" Kate like to use in her books. That class was in a totally different state and they called the beginning of their stories "leads" too! It sure does make more of an impact on kids when they hear that students in other states and professional authors go through the same writing process that they do... another example of the power of being connected.